King Noodle Records: Northwest REAL Country Music, Cajun, Zydeco, New Orleans Rhythm and Blues, Rockabilly, Rock'n'Roll CDs! We started our label in 1980, using recordings made in 1976 & 1977 plus two new cuts made that year to fill out the EP pictured to the right. 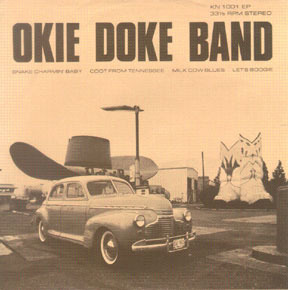 120 of the band's fans helped finance the pressing by buying tickets to see Okie Doke perform at a local winery, also getting h'ors d'ouvres and the winery tour in the bargain. The eponymous KN1001EP actually arrived from the pressing plant Jan. 2, 1981. Scroll down and check out our products! Left is a link to the live video of "Snake Charmin' Baby"- the version on the record has the talents of additional musicians Biff Bracht (piano), Bill Thurman (lead guitar) and the Okettes (backing vocals). There are still a small quantity of those EPs left in stock! Family Jewels CD Label Comp!! / NEW Jukebox Fever Comp!! / Bristol Rockin' - Click here to buy! or send checks to Blue Suede News, Box 25E, Duvall, WA 98019-0025. Newly available: Marc Bristol & Okie Doke "Live at the EMP!" The boys were opening for Asleep at the Wheel at Seattle's famous Experience Music Project Sky Church on Nov. 20, 2002, and the show was recorded straight to CD! The set included an updated version of "Let's Boogie" which appeared on that first EP, and also appears in a studio version on "Sweet Misery Moan", as well as the title song from that CD, and a version of "Goin' Down To The River", which appears on the "This Feelin'" LP and now "The Best Of Marc Bristol - Country, Vol. 2 - Glad You Come To Visit"
Click Here to Buy "Live At The EMP now via Paypal!! Marc Bristol, Christmas Day 1953. Hank Williams was still alive, for a few more days. Price List Below - 2 $16 CDs only $27!!! - Click on link to see cover & song list! - $10 ppd. in U.S., Add $2 for overseas air. Click Here to Buy "Live At The EMP" now via Paypal!! - $11 ppd. in U.S., Add $2 for overseas air. Bluegrass Blend CD - Marc Bristol w/ Okie Doke & Friends (featurest racks from "This Feelin'" and the out of print cassette release "Feel LikeFlying"
Click Here to Buy "Bluegrass Blend" now via Paypal!! - $16 ppd. U.S.. Add $2 for overseas air. Click here to order On The Edge Of Romance securely online through Paypal! Click here to order Glad You Come To Visit securely online through Paypal! Click Here to order the Family Jewels CD Label Comp securely online!! Buy Let The Good Times Roll now via Paypal!! Buy Bon Ton Two Tone Now via Paypal!! Buy Big Big Love Now via Paypal!! Buy Mardi Gras In New Orleans Now via Paypal!! Travelin' Mood - Filé Gumbo's newest CD!!! Buy Travelin' Mood Now via Paypal!! -$16 ppd. in U.S., Add $2 for overseas air (2nd $16 CD only $10 + $1 shipping!) OR - only $10 with new Blue Suede News subscription!!! Click here to buy the Jukebox Fever Comp securely online!! Homegrown Music - from the Horse and Buggy to the Edge of Space - 28 minute VHS video on homemade instruments (washtub bass, washboard, jug & musical saw) also featuring Filé Gumbo, Blisswater, Okie Doke. - $17 ppd. in U.S. VHS - PAL unavailable. Box 25, Duvall, WA 98019-0025 U.S.A.